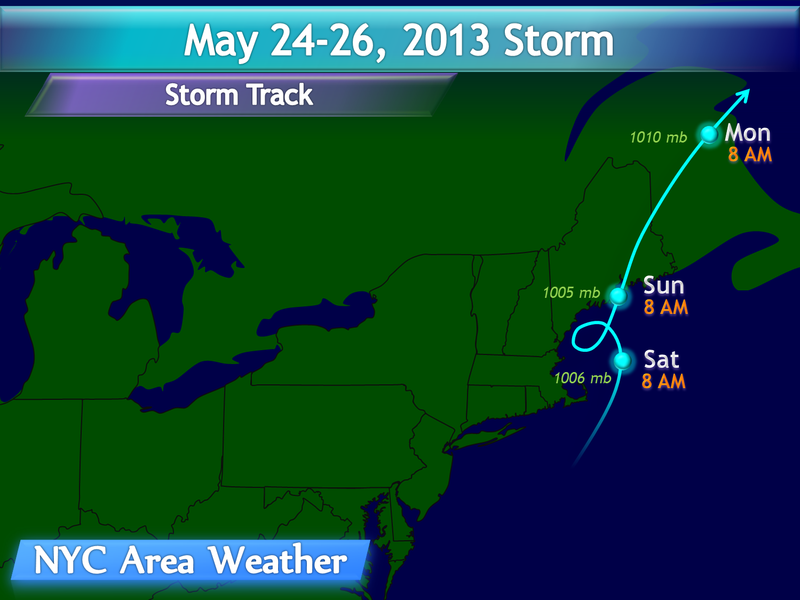 A late season nor’easter affected the region on May 23-26. A coastal low developed along a stalled frontal boundary and tracked up the Northeast US coast, producing widespread moderate to heavy rain, winds, and unseasonably cold temperatures, which also resulted in widespread frost and even major snow accumulations in the high elevations of New England. A strong low pressure intensified and stalled in the Midwest region in the May 21-23 time frame, with a stalled frontal boundary extending east of the low into the interior Northeast, separating a warm and humid air mass to the south from a cooler and wet air mass to the north. As a trough approached the region on May 23-24, it became negatively tilted, with a wave of low pressure forming over PA/NY on Friday, May 24. The shortwave continued to dig further south while the main trough lifted north, with the shortwave splitting into an upper level low over southern New England early on Saturday, May 25. A low pressure developed at the surface off the southeast New England coast, intensifying while tracking north with a minimum pressure near 1005 mb on Saturday. The storm at that point was producing widespread rain and high elevation snow in the Northeast. The storm became vertically stacked early on Sunday, May 26, slowly weakening as it began to track faster to the Northeast, moving through downeast Maine and southeast Canada. The original period of rain and thunderstorms on May 23 was well forecast several days in advance, with model guidance indicating the potential for severe weather and flash flooding in parts of the region. The main difficulty in the forecast, however, was the cutoff low pressure that developed on the 25-26th. Originally, the cold front was forecast to push offshore by Friday, May 24, with dry conditions for Memorial Weekend. The model guidance only began depicting the cutoff low scenario on the 22nd, however, just 3 days before the cutoff low developed, with the GFS and ECM showing a low pressure cutting off over the region with widespread moderate to heavy rain over NY state and the NYC area, while the CMC and NAM sided with a more progressive scenario. The May 22 forecast discussion noted this difference, continuing to side with the drier outcome but noting the possibility of a wetter scenario than forecast. By May 23, the model guidance was in better agreement of a cutoff low but with differences regarding the exact outcome, with the ECM showing a slower system with rain lasting through Sunday, May 26; the GFS showed a somewhat more progressive low exiting the region by Saturday evening, May 25, and the NAM kept most of the rain to the east. These differences narrowed down on May 24 as the models settled on most of the rain staying north and east of the NYC area, with light rain and unseasonably cold temperatures, with the storm exiting late on the 25th into early on the 26th. Regional radar image from 4:18 PM 5/23, from the National Weather Service. Heavy storms can be seen in northeast NJ, SE NY and NW CT, with additional scattered storms in western NY. Prior to the development of the coastal low, widespread severe weather was observed in the Northeast in the May 22-23 time frame, with two tornadoes reported in central New York state. On May 23, a band of heavy rain and thunderstorms trained over a narrow corridor from northern NJ into SE NY, NW CT and central MA, where 1.5 to 3 inches of rain were observed, locally as high as 4-5 inches, resulting in flash flooding. Widespread light to moderate rain fell on Friday, May 24, as the cold front moved through, with reports of isolated locations in western New York state mixing with sleet and snow. Regional radar image from 1:18 PM 5/25, from the National Weather Service. Widespread rain fell in eastern NY state and western New England, mixing with snow in the higher elevations. As the coastal low developed on the 25th, widespread moderate to heavy rain developed with rain bands stalling over eastern NY state and western New England, as well as eastern Maine, while clipping northern parts of the NYC area. A breezy NW wind was observed with unseasonably cold temperatures, only reaching the upper 30s and 40s for highs in eastern NY/western New England, and the lower 50s in the NYC area, when average temperatures are in the 60s and 70s across the region. In the higher elevations, such as the Adirondacks, Catskills, and the mountains of Vermont and New Hampshire, heavy snow fell especially in the morning hours, slowly mixing with rain throughout the day as surface temperatures slowly warmed up. As the storm became vertically stacked, rainfall gradually weakened and shifted north overnight into early on the 26th. An estimated rain total map will be added soon. Prior to the nor’easter, on May 23, widespread rain totals of 1/2 to 1 inch were observed across the Northeast region, with the heaviest rain focused from northern NJ into SE NY, northwest CT and central MA, where 1.5 to 3 inches of rain fell, locally as high as 4-5 inches, resulting in areas of flash flooding. With the coastal storm, lower rain totals fell in the area, generally between 1/2 to 1 inch north and east of NYC with less than 1/2 inch west and south of NYC, although higher totals of 1 to 2 inches, locally higher, were observed along the heavier rain axis from eastern NY state into northern New England. The higher elevations of the Northeast, such as the Catskills, Adirondacks, and New Hampshire/Vermont, recorded snow mixing with the rain, with flurries and sleet also reported in some of the lower elevations. Acumulations were generally minor, although the highest elevations in the Catskills and Vermont recorded over a foot of snow, with totals locally as high as 2+ feet in the Adirondacks.